History: Chaucer and the other four dogs in his litter were not registered with the NGA or trained to race, although they are tattooed. His owners told TAGS that Chaucer is part of a litter of KNK Kiowagitgone (TAGS’ Tippi) and Nita’s Wild Bill (TAGS’ Billy). They must be wonderful dogs with those parents!!! 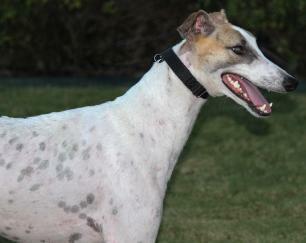 Chaucer has very distinctive coloring – white with black ticking and lightly brindled patches. His eyes are rimmed with charcoal grey giving him a very striking face. 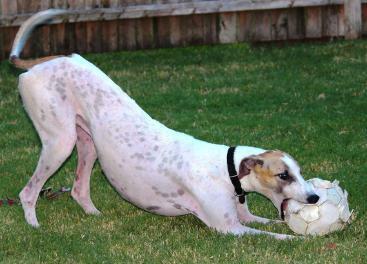 Chaucer has spent his entire life on the farm with his litter and other Greyhounds. This is an entirely new environment for him so it will take time for him to adjust, but he had a good start. 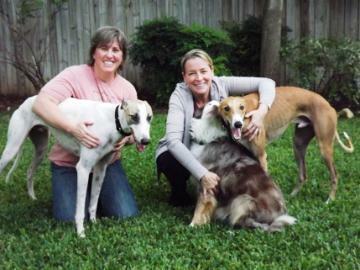 Chaucer (now Gibbs) and Red (now Hank) with their new family Carlene, Rita and fur sister Callie. 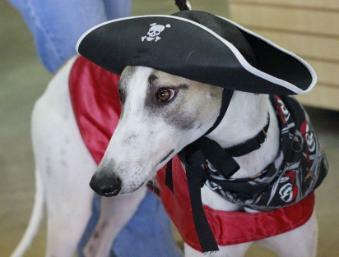 October 12, 2012 update: Chaucer (now Gibbs) was adopted to his lifetime home with his litter-mate Red (now Hank). September 9, 2012 update: Chaucer’s first day with TAGS was a little stressful for him. 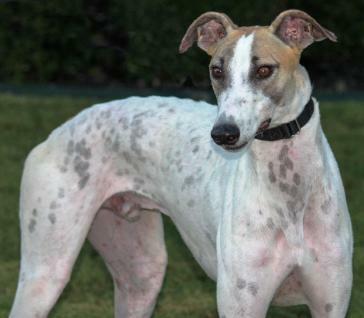 After having a bath and scrubbing, he took a ride in two different cars (which was unusual for him), was introduced to a house with two cats, a Greyhound and two Italian Greyhounds. The dogs didn’t faze him. He just went with the flow, even playing with them in the yard and chasing a toy. The cats were a little more of a challenge for him. He was interested in sniffing them and following them but the humans kept sternly telling him “NO KITTIES,” “LEAVE THEM ALONE,” and “NO CAT.” He definitely reacts to discipline – he does not want to displease you. He was beginning to get the message about the cats and finally gave it up. After a good night’s sleep, tomorrow may be a different story. That will be reported in detail. He is very affectionate and seems not to know that he is too big to be a lap dog. 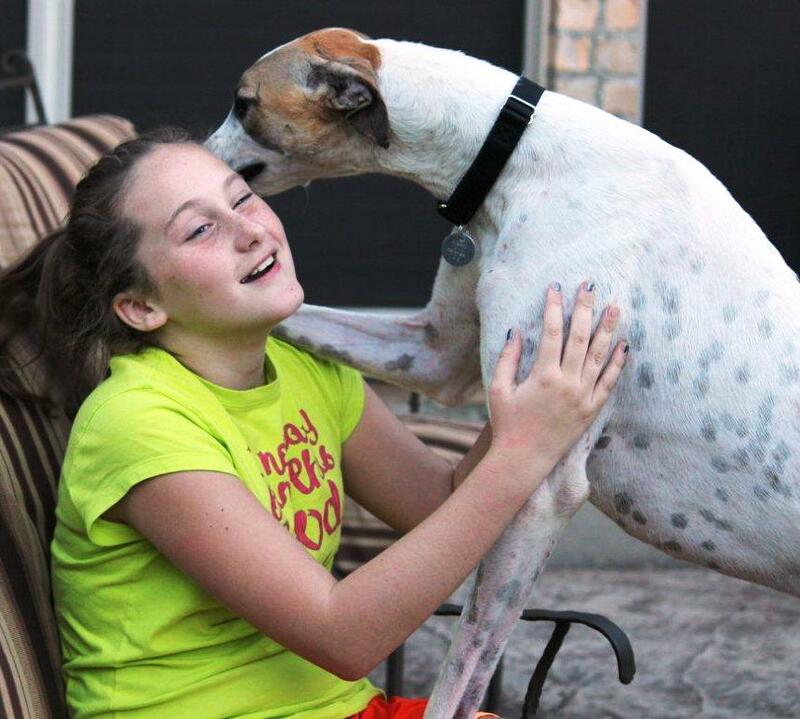 The object of his affection is the 11-year old girl in the family. It will take some time for Chaucer to learn the house rules and boundaries, but he will be a willing student – he really wants to please.